With professional support, we help create, shape and respond to legislation and regulations that could enhance or restrict the practice of veterinary medicine in Oregon. In doing so, we ensure fair treatment and consideration of the practitioner’s point of view. When necessary, we also align ourselves with other organizations and interest groups with similar objectives to broaden our effectiveness. While you are treating and caring for your patients, the OVMA is focused on your professional and business interests. As a result of our diligence, we have stopped harmful legislation from being enacted or unnecessary regulations from being implemented. As a result, we have saved Oregon’s veterinary practices more than $42 million since 1989. For the average practice, this equates to a yearly savings of more than $4,200. Your personal information should remain private. We loudly shared this point with former Governor Kitzhaber after an Attorney General’s Office ruling declared that your personal email must be made available through the Oregon Veterinary Medical Examining Board upon request by anyone who asks for it. This was wrong, and the former Governor agreed with us. In fact, he introduced broad legislation that included limiting access to your personal information (i.e. home address, phone number and private email). Without a compelling reason, your information no longer can be obtained through Oregon’s generous public records law. When the legislature sought to address concerns over methamphetamine production and use in Oregon, veterinarians became entangled in the web of unintended consequences. The intentions of the legislature were good, but the new law was impractical and placed a significant burden on veterinary practices: you were required to record and report (to the county sheriff) monthly any sale of drug precursors for meth production such as PPA, MSM and pseudoephedrine. You also were limited to prescribing only a small quantity of these drugs for patient care. The OVMA worked closely with the legislature to amend the law. We obtained an exemption from the law – one that protects your patients and clients and one that is less of a hassle for the healthcare team – provided that you have a valid VCPR and such drugs are issued as a prescription and documented in your records. The further veterinarians are removed from the care and welfare of animals the more potential harm there is to animals. That is why the OVMA introduced and helped to pass legislation that imposes a penalty of up to $5,000 per violation against an individual who practices veterinary medicine without a license. 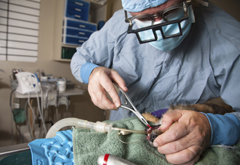 And it is why we also initiated a rule change in the Veterinary Practice Act to include dentistry on animals as the practice of veterinary medicine. The OVMA has also conducted an Illegal Practice Survey (results available to members) to better identify areas in companion and large animal medicine where lay people are inappropriately treating animals – and in a number of instances causing harm to these animals. This is a difficult and challenging issue to address, but we will continue to monitor this important topic, and, when and where we can, help to take action against offenders of the Veterinary Practice Act.